No matter how small the space is, it can be very comfortable like what they did to this apartment. Many homeowners worry about space thinking that they will not be able to live comfortable in a home that is too small. But with the creativity of designers these days, we will realize that can actually live wherever we want to- may that be an old bus or a tiny apartment. What makes a difference is a way the layout is done and how furniture is used. We have featured many small apartments before and today, we will show you another apartment with a small floor space but with totally huge function. The clients of MKCA were able to acquire a 225 square foot space in Manhattan’s West Village. The home has an adjoining 5ft tall storage attic space and they want to transform the minuscule space into a gracious and multi-functional home. 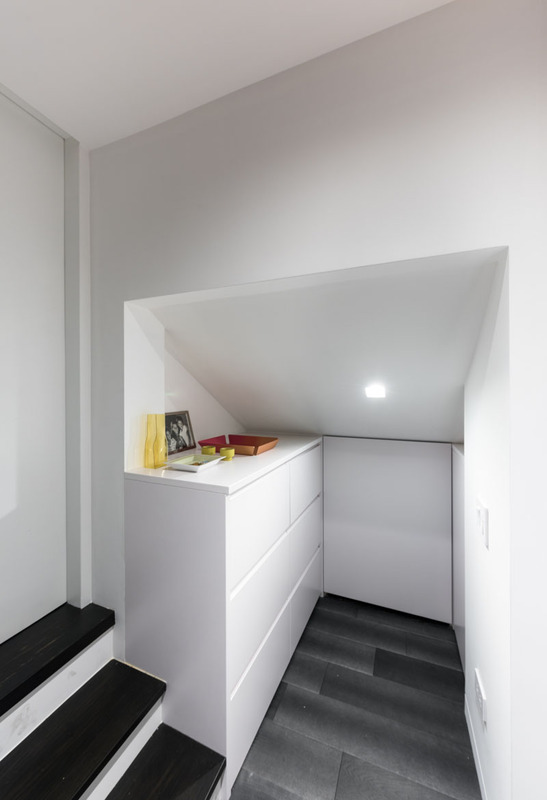 The project, which is called Attic Transformer, takes advantage of the compact attic space which while not standing height since it can offer various functions for the apartment. 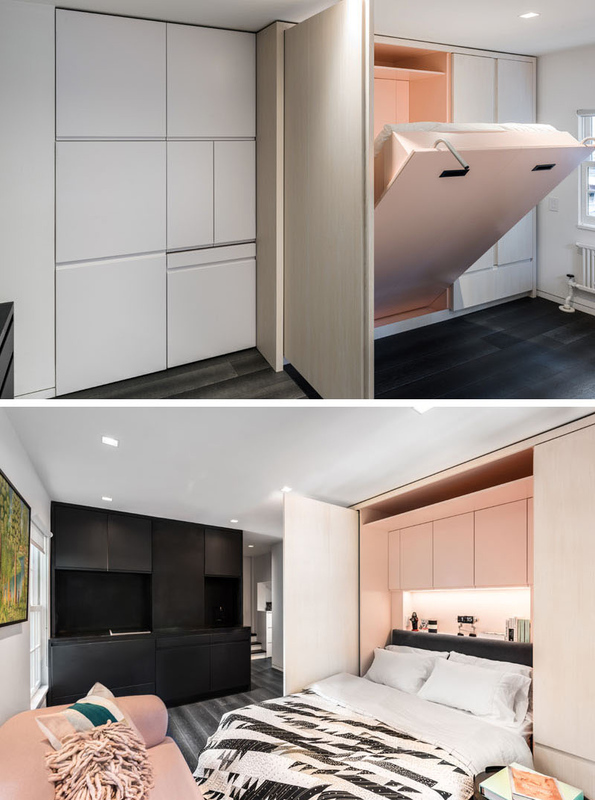 It was aggressively subdivided and loaded with custom fabricated transforming elements like hanging clothing storage, pantry storage, and a pull-out dining table, paired with a pull-out workstation that converts the table into a home office with desktop computer and storage below. The transforming elements in the apartment make living comfortable. The owners can even cook, dine, work, and entertain guests even in a tiny space. The space was rebuilt from the inside out, including new thermal and waterproofing systems at the three exterior facades and roof. Extensive upgrades were made to the structure but what we will see below is the interior of the home. The luxurious and youthful interior was achieved by adding custom millwork as well as vintage and contemporary furnishings. Unique feature: Despite the small space, this modern apartment has everything one needs to live comfortably. Aside from that, it looks really amazing. The interior of the house has a crisp palette of pickled ash, white lacquer, scorched white oak flooring, and charcoal Corian. This space is used for living, dining, working, and even for small-scale entertaining where a bed can be accommodated. This is the living room located next to the black kitchen. You can see here the wall of cabinetry that you have seen above. For sure you can now picture how small this apartment really is merely by looking at this photo and the previous one. The apartment has multiple closet and storage spaces. One closet has a mirrored door with a small area for storing books and other personal items, and below that is a second closet with a bar for hanging coats, shirts, and pants. 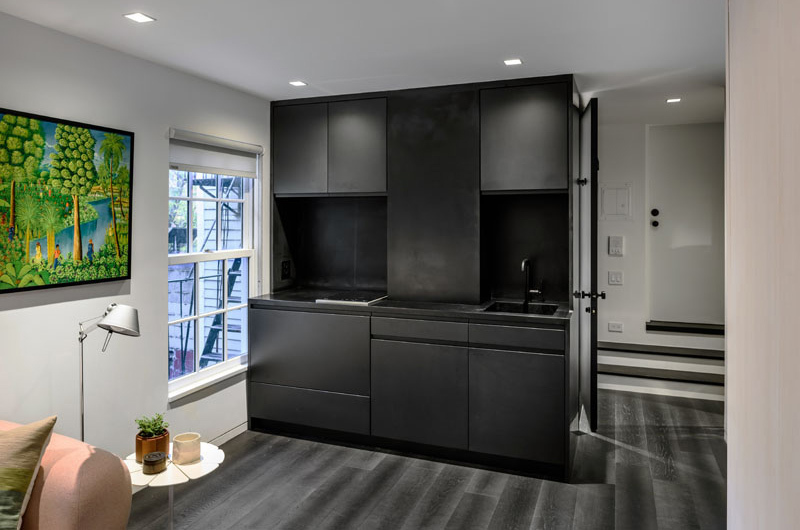 What you see here is a compact volume of black Corian and charcoal lacquer that contains a serenely spa-like bathroom and a pull man kitchen with refrigerated drawer and induction cook top. A major component of the cabinets is the wooden section where a bed is kept. 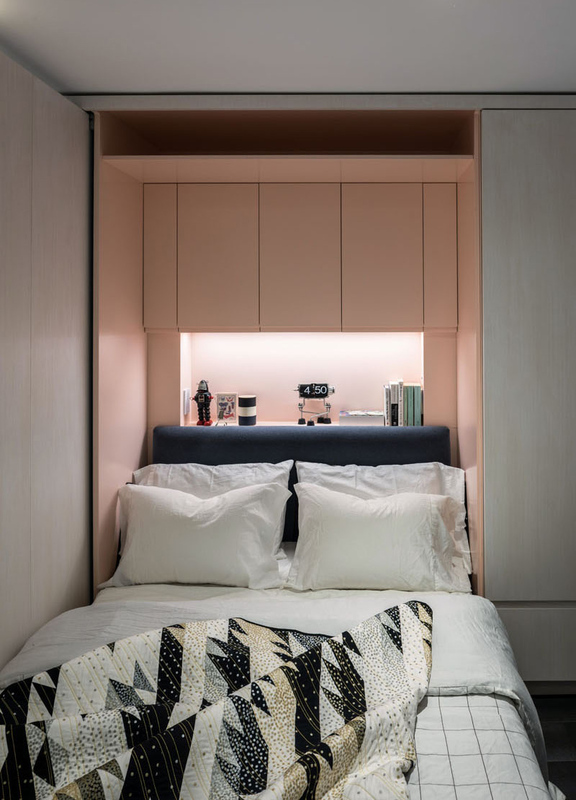 The bed folds down to reveal a headboard, more storage space, and some hidden lighting. Who would expect that this bed was actually merely pulled out from the cabinet? It looks comfortable and cozy. Aside from the bed, the centerpiece of the main living space is a six-foot long pull out dining table that can also be converted to a home office simply by sliding out a powered compartment containing a desktop computer. But that doesn’t end there, this cabinet retracts smoothly into an attic space behind the wall. The apartment is actually made up of three spaces, a small entry space, a main room, and a bathroom. What you can see here is the small entry space that houses a cabinet with storage. A home won’t be complete without a bathroom. 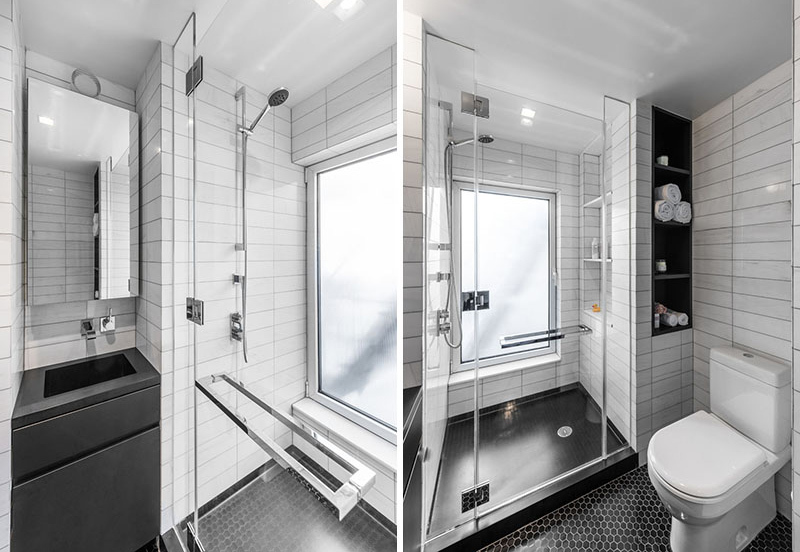 This small bathroom is located behind the kitchen, and it has a small walk-in glass enclosed shower. To make it look spacious, white tiles have been utilized. 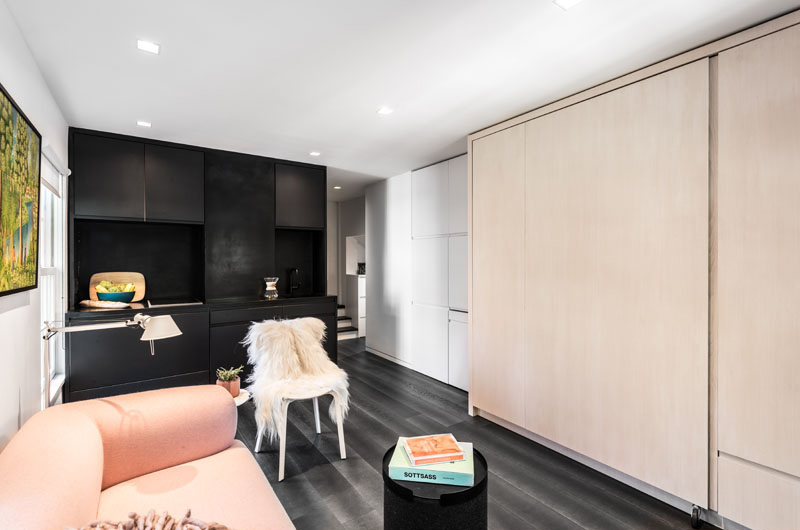 It also features black open shelving that adds some additional storage to the small space. 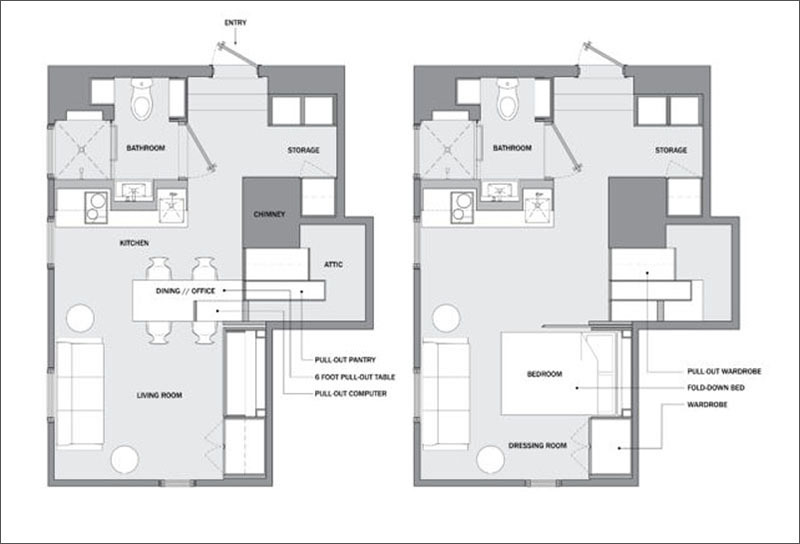 This is the floor plan of the apartment which shows the exact layout as well as the functions of everything in it. This interior design from MKCA will definitely inspire you especially if your space is small. This will make you realize that no space is too small to live because it actually depends on how the area’s layout is being done. Also, it depends on how creative a person could be in terms of storage and even the choice of furniture. 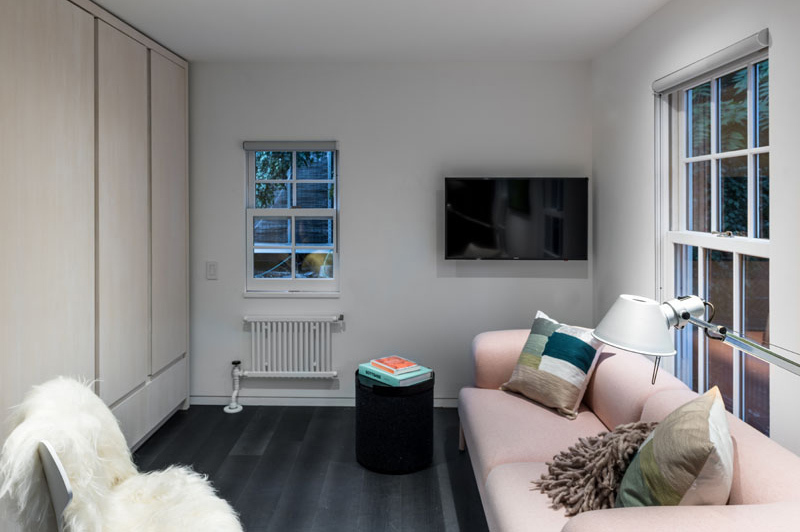 For small spaces, it is always important to think outside the box in order to achieve a home that is cozy and comfortable.